The advantages of plastic Windows are undeniable, they greatly facilitate the life of Housewives: their is no need to paint, putty, warm in the winter. But in order for the plastic box will serve you longer for him to properly care. If your window was installed recently, and you decided to bring it in in the first place, it is necessary to remove the protective film from the plastic frame. If you miss this point and do not clean it immediately, the film can firmly adhere to plastics, to move it will be difficult and can damage the window. As in the case with wooden Windows, start to wash with the frame. To wash the plastic profile, it is necessary to prepare a basin with warm, soapy water, rags of soft fabrics or cloth, including microfiber. Plastic does not tolerate brushes or sponges, scratching the surface. As for detergents, in shops of their choice is so great that every woman buys the wipers, guided by personal preferences. By the way, for washing, plastic, suitable even for liquid detergent for dishes, most importantly, that it does not contain abrasives. But the use of powerful tools, which include solvents, gasoline or lye, is impossible. 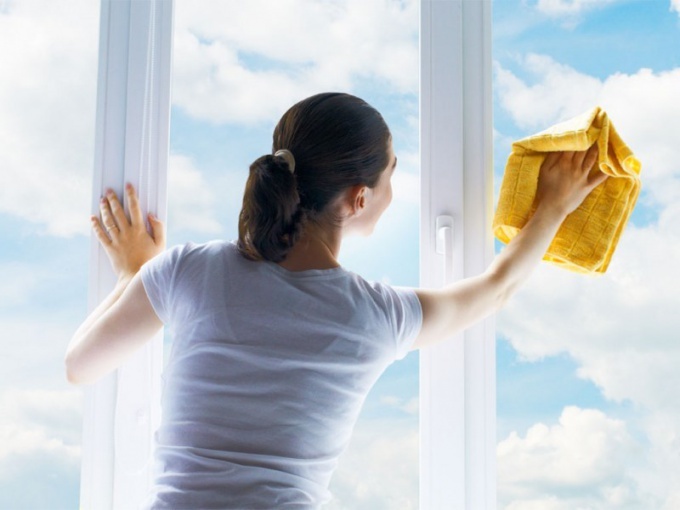 Wash high Windows in places where you cannot reach it with your hand using a special MOP on a long handle. Plastic profile can be cleaned easily with soapy damp cloth. Contaminated sites will require a little effort, but to scratch and scrape no means impossible. Definitely need to clean the drain hole. It is located in the lower part of the window. This hole gets the dust, poplar fluff, dirt. If the drain hole is clogged with mud in the winter window will be much to freeze. The next step will be the cleaning of the rubber seals. This is an important part of the window, taking care where required. Need to wipe with a wet cloth all the gum and then wipe dry. Each time, looking outside the window, you should pay attention to the integrity of these elements, inspect them for nicks and cuts. Wiped dry with the rubber bands should be lubricated with silicone grease. You should also treat all the furniture with special oil. These tools are usually sold as a set. Washing glasses, plastic Windows is no different from washing hardwood. Wet soapy rag erases all impurities from both sides of the glass. Next, a cover means for washing of glasses. Dry cloth microfiber or microfibre tool is removed, and the glass is wiped dry. If still left stains, you can once again wipe the glass with crumpled newspaper. In conclusion, you need to wash the window sill. Its surface is wiped with a damp cloth and detergent without abrasive and wiped dry.